February 26, 2019 — (Wilmington, DE) — The Catholic Diocese of Wilmington will present a four-part multimedia Lenten series that will be distributed via digital video, radio broadcasts, and podcasts, the diocese has announced. Written and hosted by the Reverend Richard J. Jasper, Associate Pastor of Saint Ann Church in Wilmington, Delaware, the series is designed to help individuals and families get the most out of the Season of Lent and prepare spiritually for the coming of the celebration of Christ’s resurrection at Easter. Father Jasper presented a similar series for Advent last December. Titled, “Holy Boldness: A Journey Through Lent with Four American Saints,” each 13 or 14 minute presentation will focus on the life of an American saint, or religious leader; Saint Elizabeth Ann Seton, Saint John Neumann, Saint Katharine Drexel, and Bishop Alfred Curtis. 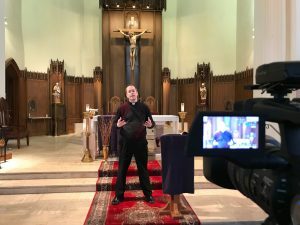 Digital videos will debut on Saturday afternoons at 5:00 p.m. during the first four weeks of Lent (March 9, 16, 23, and 30) on the diocesan YouTube channel – YouTube.com/DioceseofWilm. The next morning at 6:06, the audio portion of the presentation will air as part of that Sunday’s “Catholic Forum” radio program on WDEL, 101.7 FM and 1150 AM. Immediately following the broadcast, the program will be podcast at cdow.org/CatholicForum and on Apple, Spotify, and iHeartRadio podcasts. Additionally, the diocese has established a web page, cdow.org/Lent, which will contain the video and podcast links, as well as additional free Lenten resources. Mr. Robert Krebs, Director of the Office of Communications for the diocese and host/producer of Catholic Forum said, “Father Jasper’s communication, teaching and theology training and experience, along with his warm and engaging style, makes him uniquely qualified to present this Lenten series.” Father Jasper’s Advent series garnered close to 1,000 views and downloads. Ordained in 2017, Father Richard Jasper holds a Bachelor of Arts Degree in English and Communications. He worked as a middle school teacher in Catholic schools in Delaware County, Pennsylvania before entering Saint Mary’s Seminary and University in Baltimore, Maryland where he earned an advanced degree in Theology. The Catholic Diocese of Wilmington was established in 1868 and comprises 56 parishes, 18 missions and 36 schools serving the State of Delaware and the nine counties of Maryland’s Eastern Shore. More information is available at www.cdow.org.